That was some good information about cropped sensor camera you gave. Now did you see Canon just announced the Canon 60DA? This new update to the 60D has some cool features. I wanted to purchase the 5D M3, however the cost factor is a problem. Now the 60DA could be a good backup for my current 7D. At the present the 40D is my backup. I know the 60DA has just been announce, but have you had anytime to take a look at the specs? If so what do you think? I was actually reading about the 60Da today. It's designed for astrophotography. I think the 60D would be a better general purpose body. But it seems like you could do some interesting specialized stuff with the 60Da. Derrick, great balanced perspective on the current camera options. Thank you. You mentioned the need for better lenses to take advantage of the latest technology, full- frame sensors. What do you think about the Canon 50mm 1.4 ? Is there a better, reasonably-priced, low-light option in the 50mm range that would be better suited for the 5D Mark III sensor? The Sigma option? The Canon 50mm f/1.4 is one of those lenses that I think Canon needs to update. For your new full frame camera, I would take a close look at the Sigma 50mm f.1.4. It's my only non-Canon lens in my bag. I've been listening to your podcast for about a year. Great info!!! A question, please. I have a Canon 60D with several good (but not L series) lenses. Was thinking about getting the Canon 24-105mm. BUT... Olympus is now coming out with the O-MD with a 12-50mm lens. Seems that this lens is a 24-100mm after the 2x factor, Thought I'd get the package and have an additional camera body plus lens for only $200 more than the cost of the Canon 24-105mm. What's your thought on the Olympus body and in particular, the 12-50mm lens. Derrick, another very informative half hour. I shoot with a 7D and I really like it, but I have always purchased my lenses with the focus of eventually getting a FF camera. The $$ will put that on hold a bit now..most likely after the holidays. My question is even though you get the added focal length with say an 50mm am I correct in understanding that the compression of the photo is still not like a true 85mm. This has been confusing to me...what I hear is that if you're looking for that look of a 70-200 or 85 is that you still have to shoot with that lens, because those are the inherent properties of that particular lens. Sorry for being so geeky but i kind of like this side of it also...I mean you guys can get geeky too! Btw If you were going to buy a new printer with 11x17 capable can you give me a good and great one to compare..and I'll decide what bullet to bite. Bart, I would have to say that's a tough call. 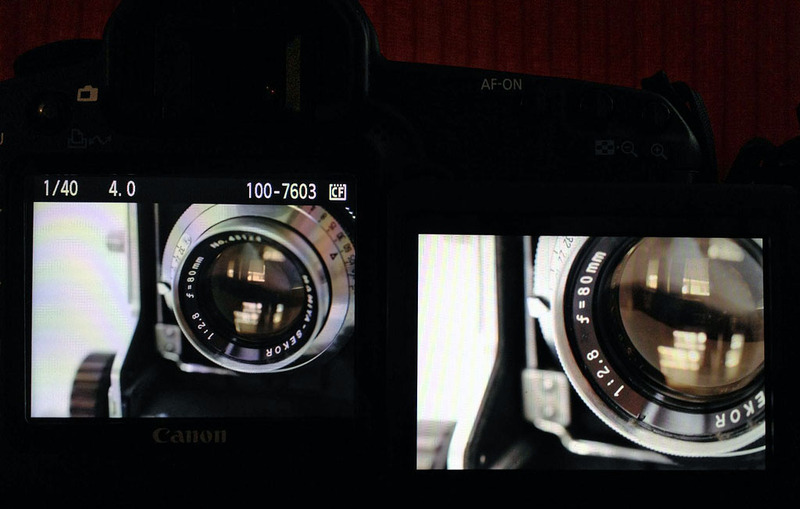 The bottom line is, the Canon 24-105 f/4 L IS is a better lens than the Olympus 12-50mm zoom. So if image quality is paramount, then I would go that direction first. I depend on the 24-105mm for my pro work, both on the 5D Mark II and the 60D. And Terrell, yes, you are correct: a 50mm is still a 50mm regardless if it's on a full or cropped frame camera. There is magnification, of course with the cropped sensor, but the inherent qualities of the lens are very similar regardless of the body it's mounted on. Great podcast. I tried to guess what your five advantages would be and I was pretty close. I have a couple more. 6) Greater apparent depth of field for macro and landscape shots. Having learned on a rebel, when I bought the 5D Mark II I was surprised by how much shorter the apparent depth of field is. 7) Having both a full frame and crop camera doubles the usefulness of your lenses. My 17-40mm on my 5DII is an ultrawide, but I can use it on a crop camera as my normal lens.